A friend/ neighbor (from neighboring apartments), Marc Bührer and I walked across the road for a morning meeting, at the local health restaurant we have on our doorstep. A black coffee for him, a smoothie for me and we sat down as I eagerly awaited to hear about this exciting project of his. It’s one of those projects that makes your immediate world a better place, with a ripple affect. 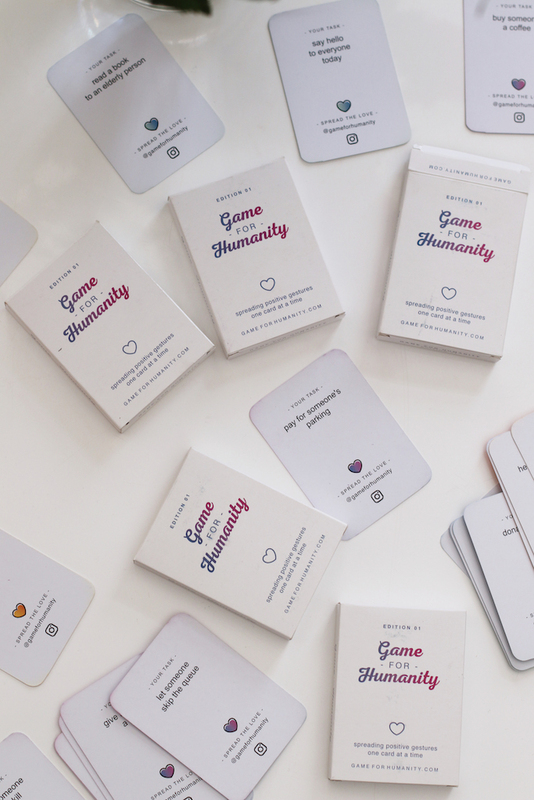 Allow me to introduce you to Game for Humanity. 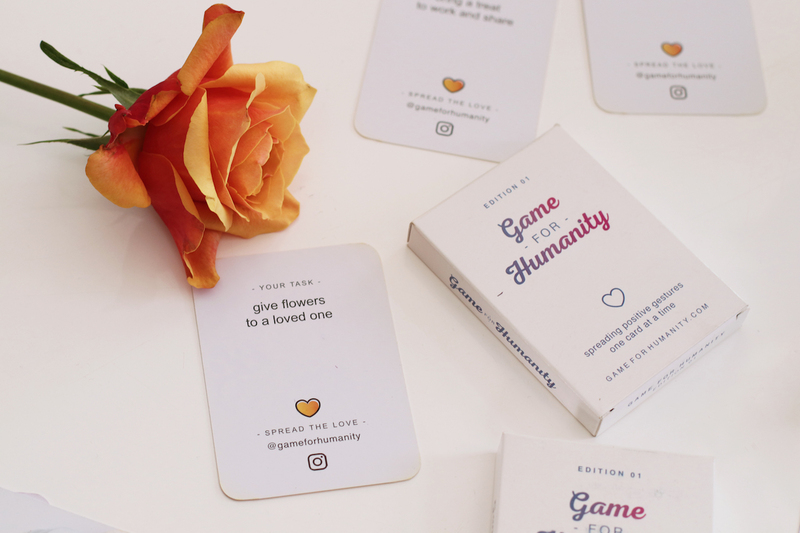 It’s somewhat inspired from Cards Against Humanity, but it’s a “game” you play in every day life, not just around a table with some mates and glasses of wine. 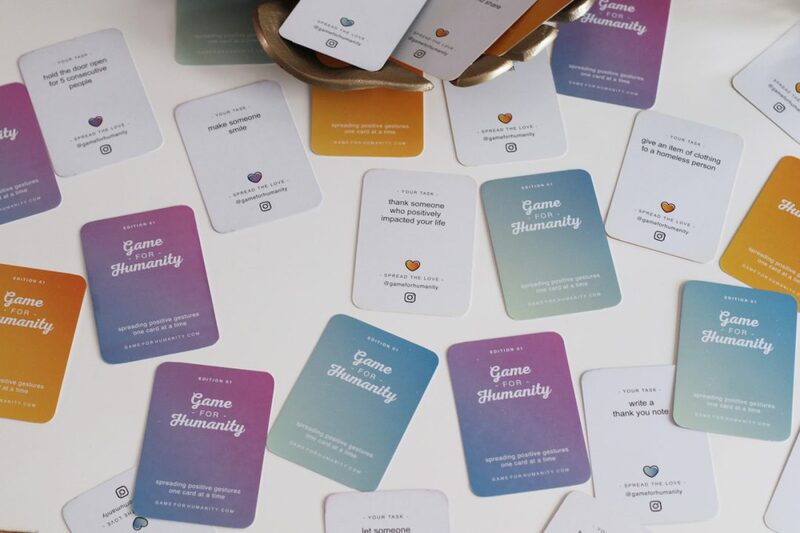 It’s an interactive game that promotes random acts of kindness and allows you to play it forward. Whenever you do something kind for others, it’s an instant mood booster and there is no other feeling like it. There are 30 cards in a pack. Each card has a random act of kindness on it. Once you’ve completed the act, you then hand the card to the person you played the act out with and encourage them to do the same act and hand that card on, and hopefully the act will keep being payed forward. 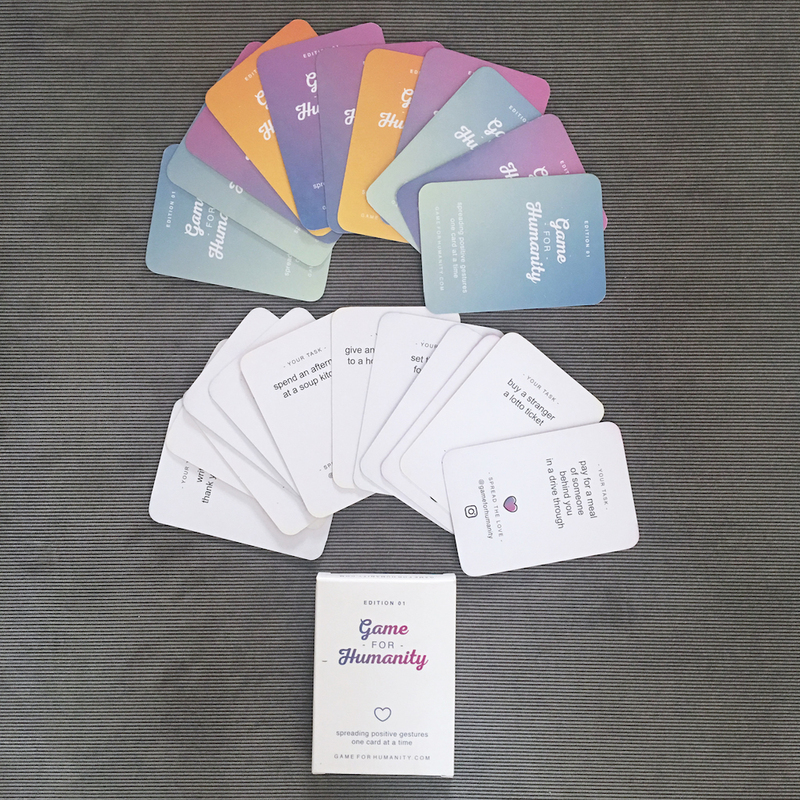 As there are 30 cards, you can either hand a card to 29 of your friends, family and colleagues and get them to each do an act, or do an act a day or twice a week. There are no rules… the only rule is to make the cards active and not have them sit in the box. I asked Marc why he had created this and his answer was simple, yet profound. We had a big chat about social media and how it can be really positive too. Speaking of digital, Marc’s been asked if there will be an App version, but while he says he’ll never rule anything out… He wants to give humans a chance to actually interact with one another first, before taking it digital. What type of Random Acts of Kindness are we talking about? I love that these cards serve as little reminders to do something for others and they’re actually ridiculously simple to complete. The simplicity of them spurs on the mindset of thinking beyond your own means and needs. I often hear of people saying they want to help others or do something for others but they don’t have the money. I think people associate help with two things. 1. monetary value and 2. those seriously disadvantaged. The greatest gift you can give anyone is time and everyone can do with some love and kindness in their lives. Everyone! With that being said, these acts are not time consuming at all and actually quite easy to complete. As I was flicking through my personal pack, I started smiling. They’re really easy to do and I immediately began to think about how people would react to an act of kindness, followed by me passing the card on and encouraging them to pay it forward. I thought about how I would react if I was on the receiving end. It’s going to be an amazing exercise to do and I want to create a challenge for myself. More on that soon. 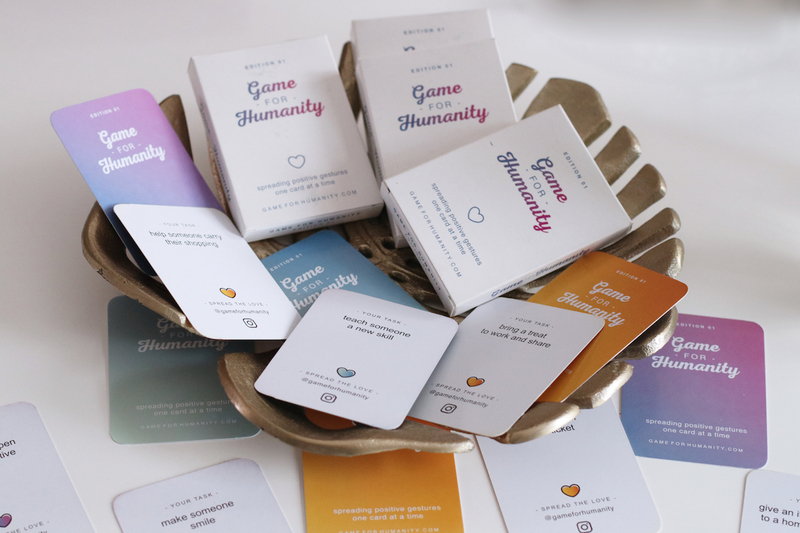 What’s next for Game for Humanity? Corporates have the opportunity to co-brand. Companies can have their logo on the packaging and cards can be tailor-made. It can promote positive mindsets within a company and an opportunity to be incorporated into CSI charity initiatives. It also promotes productivity and camaraderie. This month, a School Edition is being launched. The idea is like swapping baseball cards, but the cards have the acts of kindness, related to school, sport and activities and have to be completed and passed on. It promotes a positive mindset within the kids and also promotes acknowledgement and interaction with each other. I think this is something urgently needed, especially with bullying being so rife. Want to win your own box? Marc very kindly gave me 4 boxes to give away. If you would like one of the four, please leave a comment here on the blog and follow them on Facebook and Instagram to get inspired. I’ll do the draw this Friday, 31 March 2017. This is so lovely! What an awesome game. Wonderful idea!!! This is way better than cards against humanity! Well done! 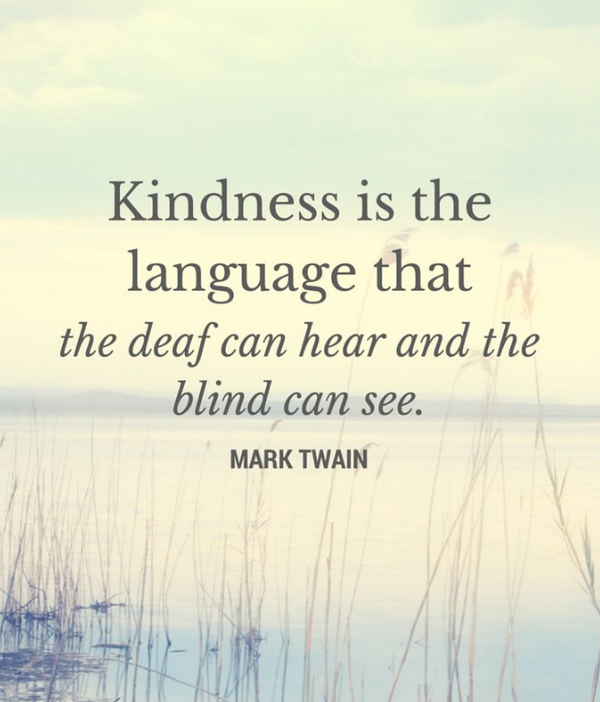 A refreshing look on how to pursue everyday kindness. Happiness is often thought of moments we’re aiming for in the future. I’ve recently endeavored to slow down, to absorb the moment, to remember happiness is right here in front of you and to include small tokens of mindfulness of others. I’m sharing my thoughts with family, and I think this ‘game’ would be an excellent addition to my new objective:). HI Cil, not sure if you received my newsletter announcing you as one of the winners – congratulations! Please will you email me your daytime delivery address and contact details. This is amazing ! I absolutely love the concept Would love to win a set ! I think this is a great antidote to all the negativity in our world at the moment! Love. Love. Love. Oh this is just the most wonderful thing I’ve seen in a long time! I would love to get a box and would have so much fun handing out all 30 of my cards. The idea of sharing it online is brilliant as it gets more people aware of the movement, and they can share in the joy and excitement of the receiver! This has honestly made my day! The best idea ever. I think we have all become very “me-orientated” thanks to social media, & constantly feel like we are in competition with one another. 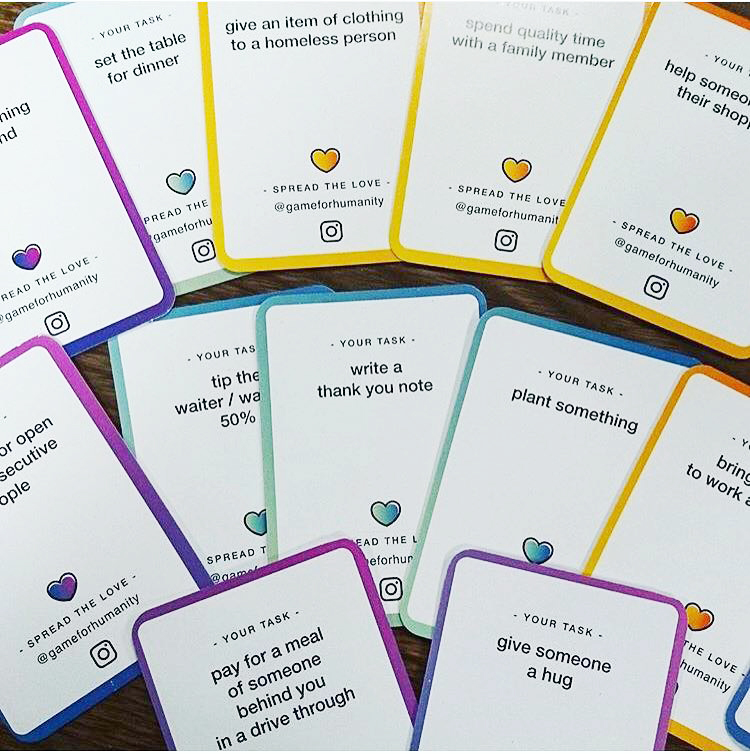 These cards are a great reminder to do what we were brought up to do – be kind to one another & put others first. Love love love! Hi Megan, not sure if you received my newsletter announcing you as one of the winners – congratulations! Please will you email me your daytime delivery address and contact details. What an awesome idea. Followed on Instagram and Facebook. Now waiting for the cards then I can really play with the family and friends for real !!! I think this is an amazing idea for people, we could do with a little more love and peace on earth. With all that’s going on in the world we can start to help one another. Great concept Marc!! This would be really cool to do! I have already ordered a set! Its such an awesome concept. This is the best idea!! Would love to win this… and encourage my boys to do it with me so they can learn about acts of kindess towards those around them!